As chiropractors we are very worried about the number of patients we are seeing with forward head posture. It has become so common that looking around in a crowd you will see many people with this and they no longer look out of place. Sometimes they are in the majority. In fact these people with their heads poked forward have lost the normal cervical curve in the spine and this has a profound knock on effect on the whole posture, including the other normal spinal curves and musculature. 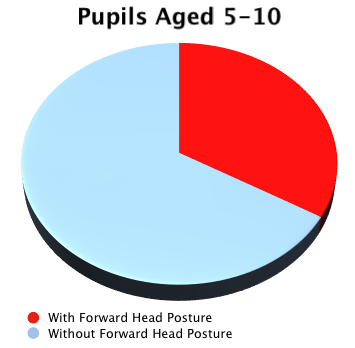 Here we can see that over a quarter of students aged 5-10, were found to have forward head posture. That is 150 out of the 448 that we checked for that age group. 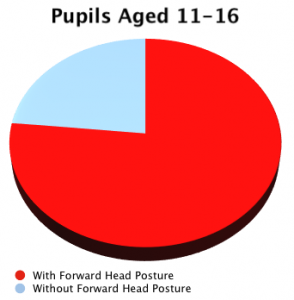 The second graph illustrates the proportion of pupils aged 11-16 that we checked who had forward head posture. The graph shows that more than three quarters of the pupils checked, 125 out of the 163, showed signs of forward head posture. We ask ourselves why this is happening. As yet we have no concrete evidence, but our lifestyles have rapidly changed over the past 20 years so that younger and younger children, and most adults are now spending many hours seated in front of computers, texting with their heads down and playing with hand held games. We know, as chiropractors that patients are coming to us with work related, sedentary work related repetitive strain injuries, including, neck and shoulder pain, headaches, shoulder pain and low back pain. They almost always tell us that this is worse at the end of the day or after sitting for hours at their computer work. It is like an epidemic here in Dubai. Often, people try to counteract their seated jobs with some exercise after or before work. This can be successful as long as things have not gotten too far. If the exercise is the wrong kind, too much too soon, it can make matters worse. If you have been sitting for years with no exercise or help, you will benefit from the help of a chiropractor. We make sure your whole spine is flexible and all the joints are mobile. We have created a complete rehabilitation program for the posture, which can be done at home or in the gym. We also have individual personal one to one training in our rehabilitation studio to enable you to recover your correct curves. This patient kindly allowed us to use her picture to help others understand the problem and be able to take action like she is. She has regular chiropractic care and a home exercise program. She will be checked each visit for improvement in her posture, which will come about slowly if she keeps up her exercises. The normal spinal curve is lost . 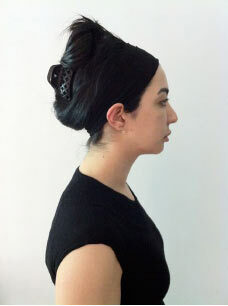 This straight spine is always present when we see forward head posture. In this person the curve is reversed. The curve is supposed to be like a c shape. The brain needs feedback from the body and in particular from the spinal joints and muscles in order to maintain any posture, such as sitting or standing. In fact C4 vertebral level in your mid neck has the most nerves feeding back to your brain and when the nerves are stretched due to a straight curve, it gives “false readings”, which perpetuate the poor posture. This is why regular correct and frequent exercise can change the false pathway and create new better postural pathways, which can break bad old habits. Here we see a correct curve. This is a 70 -year old woman, so there is slight degeneration, but she has experienced no computer use and very little mobile phone usage. Attention to working positions and ergonomics, slight or radical changes to your exercise routine and chiropractic evaluation and adjustments all contribute toward a positive outcome in postural improvement and correction.